описание Простой редактор тэгов. Поможет навести порядок в вашей музыкальной коллекции, заполнив все необходимые поля ID3-тэгов: название трека, исполнитель, альбом, дата релиза и пр. С помощью ID3 Editor вы сможете добавлять обложки альбомов. Для этого просто перетащите нужную картину в окно с программой. Поддерживаются следующие форматы: JPEG, PNG, GIF и TIFF. 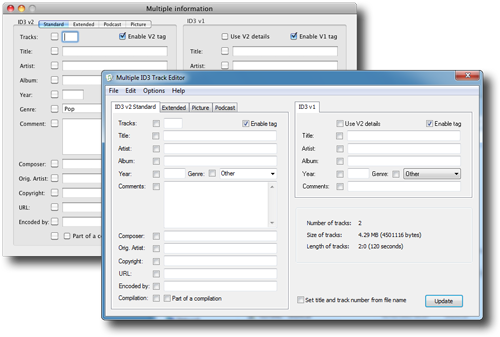 description ID3 Editor is a small and simple MP3 and AIFF ID3 tag editor, which offers the ability to edit the most wanted attributes of the ID3 tags in one window. Although iTunes offers a good interface for editing tags, it does have a few important attributes missing, e.g. 'copyright' and 'encoded by' which is where ID3 Editor saves the day. MP3 ID3 tags are used to store important information of a music track, such as the track 'title', track 'number', 'artist', 'album' etc. and even the track artwork. The information can then be displayed in your favourite MP3 player application or on your portable player such as an iPod, a Walkman or other music hardware. is now available. This version adds native x64 support which is required by 10.13.6 or newer.